Paterson is a movie that is kind of the opposite of Chapin’s quote. In just under two hours, writer/director Jim Jarmusch tells a story about one week in the live of one man in the town of Paterson. While Paterson is the third most populated city in New Jersey, “Paterson” (Adam Driver – Star Wars VII: The Force Awakens ) lives a relatively small-town existence in this urban setting. Yes, his name is the same as the city where he drives a city bus five days a week. He lives with his wife “Laura” (Golshifteh Farahani) and their dog Marvin in a small house. He wakes up every morning without an alarm, puts on his watch, picks up his already laid-out uniform and eats his cereal in the same small bowl. During the day he writes poetry in his private notebook. After dinner with Laura, he takes Marvin for a walk. During the walk he stops at a bar owned by “Doc” (Barry Shabaka Henley – Four Brothers) who plays chess against himself at the bar, won’t install a television in his place, and keeps a Wall of Fame regarding famous Paterson persons. Paterson has one nightly beer and while he drinks it, he observes life taking place around him. “Marie” (Chaston Harmon) has just broken up with “Everett” (William Jackson Harper) who won’t stop trying to win her back. Laura has dreams. She dreams of turning her penchant for cupcakes into a business. She buys a guitar because she dreams of being a country singer. She had one dream where she dreamed that she and Paterson had twin daughters. But most of all she dreams of getting Paterson to share his poetry with the world. She finally elicits a promise from him that over the weekend he will make copies of his poetry. After learning that his wife had a dream about twin daughters, Paterson keeps seeing twins as he drives his bus. When the weekend comes, Laura wants to celebrate the success of her cupcakes at the local farmer’s market by taking Paterson out to dinner and a movie. When they return home something big has happened. 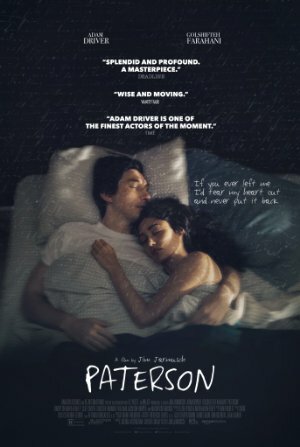 Like any film from Jarmusch, Paterson is a bit slow but not to excess. His brand of humor is dry and serious but still more than adequately amusing. His dialogue has a unique tonality that he gets his characters to deliver in a way that makes it seem as natural as if it had been improvised. And as usual, he lets the camera linger longingly but not overly so on shots that might not work in the hands of other directors. Adam Driver is superb in the lead role. His Paterson internalizes his emotions but we see them on his face thanks to Driver’s excellence in nonverbal communication. This movie is worth seeing just to watch him work.